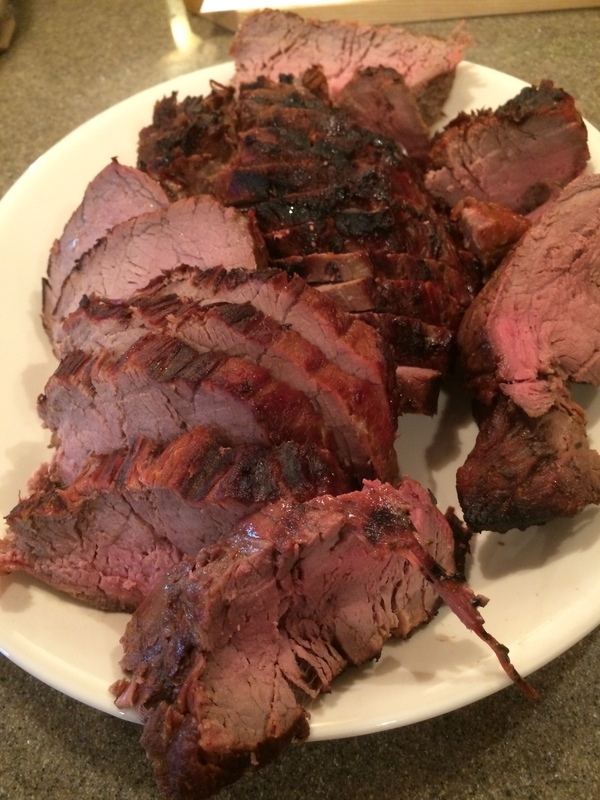 Everyone in this family loves Beef Tenderloin. And why not? It is a very tender and lean cut of beef, full of flavor. Unfortunately, this bad boy is such an expensive cut of beef that it is relegated to very special dinners. With Christmas practically here, it is a good choice for Christmas dinner. While this recipe is for a grilled tenderloin, the tenderloin can just as easily be roasted in the oven at 350° until desired doneness. I prefer the grilling method and, if you can, try it that way. We all know that man has been grilling meat since the stone age. “When you think about the history of grilling, you could say that it goes back throughout the history of man. From the time fire was discovered, we likely began cooking our meat over an open flame” according to an article in Tourism and Food. I learned how to grill using a charcoal grill but now I use a natural gas grill because it is easier to start and requires less cleanup. I used a two burner gas grill for this recipe. The marinade in this recipe is adapted from a recipe by Paula Deen and the original recipe can be found here. When preparing this recipe, you will need to allow time for the beef to soak in the marinade for the number of hours. Prepare marinade by combining the bourbon, brown sugar, soy sauce, cilantro leaves, Worcestershire sauce, water, and thyme in a bowl. Fold the tail end of the beef back underneath itself so that it is of uniform thickness and secure with butcher’s string. Place meat in a dish or extra large plastic Ziploc baggie and pour marinade over meat, cover and refrigerate for 4 to 6 hours or up to overnight, turning meat over several times. Prepare grill to a medium high temperature (350°-400°). When grill is ready, place meat directly on the grill’s hot rack and grill each side over medium heat with the lid closed for approximately 5-10 minutes or until well seared on both sides. At this point, use the indirect method of cooking for the remainder of time: Turn burner off directly under the meat, and turn the other burner on to medium temperature. Cook for approximately 45-60 minutes longer with the lid closed until desired doneness. Use a meat thermometer for best results to determine doneness. For rare, look for an internal temperature of 130-135°F, medium rare 140°F and for medium 155°F. Let meat rest at least 30 minutes before carving and serving. Serve with horseradish cream sauce on the side, if desired.